Apple iPhone 5: official details, pictures and more | What Hi-Fi? Apple has confirmed the launch of the Apple iPhone 5 at an Apple press event in San Francisco. As expected it's taller, slimmer and lighter and has a 4in Retina display. Apple billed the phone as the 'thinnest and lightest' iPhone yet. It will start at £529 for a 16GB version, with 32GB and 64GB models to come. Available in black or white the iPhone 5 will be available in the UK on Friday September 21st, and you can pre-order the iPhone 5 from Friday September 14th. The new iPhone 5 weighs 112 grams making it 20% lighter and has a new 1136 x 640 resolution. It is a 4G LTE phone and will work on the UK's 4G network from EE. The iPhone 5 will be the same prices as the iPhone 4S. UK prices TBC but in the US it's 16GB for $199, 32GB $299, 64GB $399. 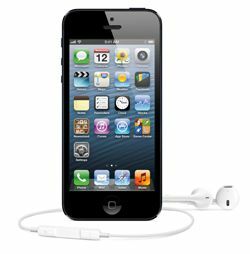 Available in black or white, it will come with iOS 6, which brings with it a new iTunes layout with a simpler design and layout, and a new A6 processing chip. The all-new A6 chip was designed by Apple to maximise performance and power efficiency to support all the incredible new features in iPhone 5, including the stunning new 4-inch Retina display—all while delivering even better battery life. With up to twice the CPU and graphics performance, almost everything you do on iPhone 5 is blazing fast for launching apps, loading web pages and downloading email attachments. The all-new A6 chip is designed to maximise performance and power efficiency and deliver better battery life, with up to twice the CPU and graphics performance. The new connector, called Lightning, is confirmed, promising to be smaller as well as 'all-digital', while there are new EarPods earphones in the box, too. See what they look like on the inside in this EarPods teardown. It features an adaptive interface that uses only the signals that each accessory requires, and it’s reversible so you can instantly connect to your accessories. You will however need an adaptor, the Lightning-to-30-pin adapter, confirmed by Apple to launch at the same time, in order to use the new iPhone 5 with your existing speaker docks and other Apple accessories. The new iSight camera is redesigned yet 25 percent smaller than the camera in iPhone 4S. New video features include improved stabilisation, video face detection for up to 10 faces and the ability to take still photos as you record. Available in black or white the iPhone 5 will be available in the UK on Friday September 21st and you can pre-order the iPhone 5 beginning Friday, September 14. The iOS 6 software will be available on Wednesday, September 19 as a free software update.